Celebrate the zombie apocalypse with the appropriate atmosphere by picking out an eerie zombie fountain or zombie mister! These zombie horror fountains and spooky mist makers will create the terrifying ambiance you are wanting. Many of our Halloween fountains and fog makers are styled to look like real horror props, including bleeding corpses, tombstones, gory skulls, and even body parts oozing on a chopping board! These decorative fountains are functional devices that will look particularly horrifying when you add a few drops of red food coloring to their water. Our ghoulish fountains and Halloween misters will go a long way towards creating the spine-tingling feeling of dread that only a good zombie outbreak can inspire. What is an eerie and creepy setting without a healthy dose of flowing, rolling mist? With this Mist Maker unit, you will have almost anything you need to create your own pale, ghostly mists that flow and settle just like heavy fog. This pumpkins eerie appearance is not the only thing it has going for it. 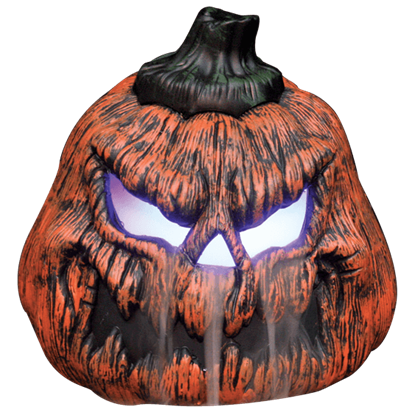 This Sinister Pumpkin Mister is more than it seems, especially when its eyes light up and curling tendrils of mist begin to drift out of pumpkins features.